The Consumer Electronics Show in Las Vegas earlier this month featured a surprising lack of in-dash car systems that can run apps. Instead, the auto industry’s current preferred approach is to run apps on a smartphone instead, but allowing drivers to control those apps using their car’s controls and screens. It’s a decent solution, and safer than futzing around with a touchscreen device at 65 mph, but in-car innovation won’t stop there. The next step, as Pandora founder Tim Westergren agreed, will be for manufacturers to design in-dash systems that run apps themselves, rather than relying on a smartphone to handle app duties. Of course, that nifty trick will require the car to have its own internet connection, which could mean paying for another data plan. Assuming you’re willing to do that, this evolution of the car dashboard as an open app platform will happen later this year with the Parrot Asteroid, a sleek-looking car stereo that runs a customized version of Android OS and connects to 3G networks on its own. 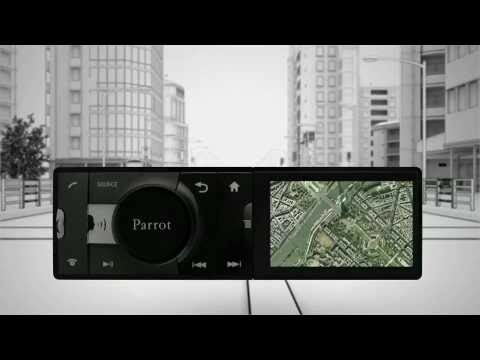 Parrot plans to target the Asteroid at the European market, but rest assured, plenty of other companies (possibly including Parrot) will try this same approach of building open, Android-or-other-OS-based app platforms directly into cars in the U.S. and other regions of the world, giving music fans more listening options within the car. Who knows, maybe we’ll finally get a consumer-ready version of the app we saw at Boston Music Hack Day for GPS that sings along with your car stereo, or an in-dash version of the Slow Down app. Coyote: An early-warning system that alerts drivers to speed cameras, accidents and traffic jams. Maps: what it sounds like. The Parrot Asteroid will be able to access the music stored on iPods, iPhones, USB sticks, and SD cards, with folders, artists and playlists navigable using the stereo’s jog wheel and 3.2-inch screen, or using voice commands, for hands-free operation, with full album art display. If that’s not enough, this car stereo can handle an audio signal from any Bluetooth device or anything with a regular analog mini jack output (although in those cases, you’d have to navigate the music on that device instead of using the car stereo). As for speakers, the Asteroid powers four 55-watt speakers and a subwoofer, while six more RCA preamp outputs would allow you to connect another amp and more speakers. Once this sort of thing becomes more common, you’ll be able to run the same music apps on your phone, tablet, browser, television, and car, only paying for services once (assuming it’s not free) across all of your platforms. As for the data plans that will have to emerge in order for this to happen, those are for the wireless industry to decide. It may not be too long before you can order wireless data for smartphone with a side order for your car.